«¡Anarquía! ¡Anarquía!» cackles a long-haired solidário as he slips out of the audience with a mischievous twinkle. 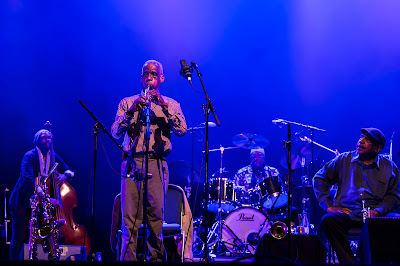 Art Ensemble of Chicago, performing a crafted one hour set, took an unexpected standing ovation from a festival crowd in the thousand-seater indoor auditorium housed in the Museu de les Ciències Naturals de Barcelona, the “Museu Blau”. The Art Ensemble grew out of the Roscoe Mitchell Sextet. In 1967 a French promotor added “Of Chicago” and the name stuck. The members felt it reflected better the cooperative nature of the group. One of the most distinctive of the avant-garde pioneers, they used warpaint and costumes to visually embody their modus operandus to challenge us. They were all multi-instrumentalists who cluttered the stage with anything from bells to bike horns. The warpaint has peeled off and the instrumentation is reduced, but the seven-piece Ensemble of 2018 still beats a strident drum. The group’s intensity, stylistic diversity, and use of world instruments puts them squarely in the avant-garde. The group’s mainstay is noisy free playing, but their set was a beautifully crafted performance that came in at one hour on the dot from the lights going down to the group walking off and the old fella shouting «¡Anarquía!». Before they hit it, the seven musicians turned and faced to the right in a moment of worshipful silence. 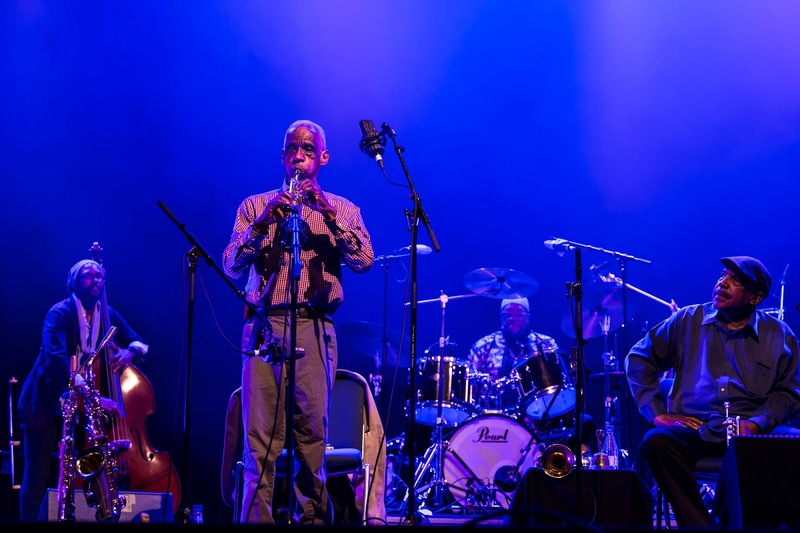 After a collective overture, founding member and saxophonist Roscoe Mitchell soloed on piercing soprano, hard and scratchy, abrasive and out there. Chiming handbells and then a fuller instrumentation builds with bowed bass and cello driving it on. Trumpeter Hugh Ragin introduced a parping lower pedal note, Mitchell issues a hand signal and the group slows down and stops, to applause. When Mitchell blows some licks or melodic phrases he has the bluesy richness of his birthplace Chicago, it couldn’t contrast more with his abrasive playing throughout most of the set. It’s impressive to avoid licks and vernacular. Even non-idiomatic free playing is now an established idiom. To do something totally unrecognisable might be an unreasonable ask for a 78-year old player and one of the inventors of this style. As out there as they are, their playing is still very much indebted to hard bop traditions. Famoudou Don Moye’s drum solo has fragmentations but generally it’s continuous and rhythmically comparatively traditional compared to the youngest player in the group, cellist Tomeka Reid calls, who calls to mind newer comparisons from modern classical and the attack of atonal jazz. During her cello solo, with pizzicato swipes and driving double stops I notice she’s reading from a music stand (Ragin has one as well). Her double stops and chromatic tonalities are very much the language of atonal improvisation, but this underlines that what you think might be free jazz might not be free, or even anarchic. There aren’t hundreds of toys but the percussion still includes football rattles, bells, shakers, gourds, whistling tubes, and Mitchell and Ragin each entered carrying three different horns. 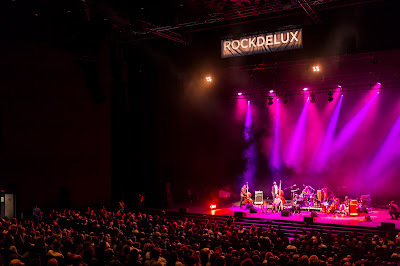 Later, the two percussionists take a stroll around the stage, with a picturesque moment of the two percussionists Famoudou Don Moye and Dudu Kouate and the two bass players Jaribu Shahid and Junius Paul, grouped together and getting down. It underlined the sense of a collective enterprise and underlines the closeness of relationships between players usually at opposite ends of the stage. Eighteen minutes in the two bass players start a cheeky boppy groove harmonised in fourths, while Reid pizzicatos the cello and Ragin issues single long piercing notes on the pocket trumpet. Mitchell returns to the earlier style of busy continuous playing with long searing notes, before the band goes into quieter feels but keeping the energy flowing and the detail rich. Dude Kouate adds a whistle to make an especially intense experience more shrill. Some melodic intervals from Hugh Ragin surprise us. Roscoe Mitchell is more of a horizontal player. He loves continuous streams of notes, whereas Hugh Ragin is more of a vertical player, using gaps and punctuation. The combination means the horns have the ongoing relentless racket but the vertical part stops it from being a flat line and prevents us from tuning out. The changing instruments in the old Art Ensemble musical toyshop was intended to disrupt the music and keep it shifting and edgy. When Mitchell returns to soprano for another nonstop flow of notes, the tone is high and piercing, but the group balance is precisely managed. Distinct tunes, passages, exchanges, pieces, ideas, changes even, they invoke with total assurance. For the last part Roscoe swapped to alto and sent us off with tunes, changes and a bassline walking a lovely hard-boiled groove in F.
«¡Anarquía! ¡Anarquía!» cackles the long-haired solidário, slipping out of the audience with a mischievous sparkle. Now I definitely get what he means.